I was upgrading Windows to 10 and checking the programs to backup. I decided to make a post about these free tools that helped me on my projects. 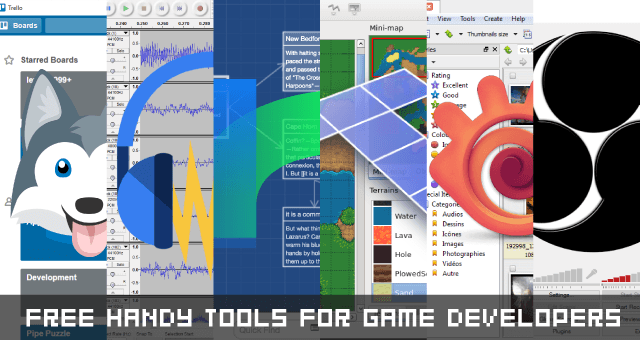 Here is the list of some of my favorite free handy tools for game developers! Milanote is a great app for taking notes. It’s like a combination of Trello, Google Keep, Pinterest. It’s simple to use, you drag and drop the tools you want to use in your note like checklists, notes, boards, columns, comments, files etc. It supports many file types and they frequently add new features. If you want to be more productive (who doesn’t :p) you should definitely check RescueTime. It tracks your day in the background and shows which apps you use, which website you visit and how much time you spend on them. It’s a bit scary I know but I think it will be very helpful to see how much time you spend on twitter instead of working. Grammarly is the best proofreading software, and it has a free version. If you made lots of grammar or spelling mistakes like me, definitely use this app. You can use it on browsers as an extension, Windows Desktop, and Microsoft Office. It’s really simple, and it made the writing process much easier. Trello is a simple productivity tool which you can manage your projects and casual plans. It’s a beneficial app for you and your team with many flexible features like creating cards, boards and listing tasks in terms of monitoring the process. Also, I’m using Trello to manage my daily plans. I have a board named Today with two lists: DO and DONE. It’s simple, but it really helps to track my day. It’s really important to make the game size as small as possible. Especially when you are making online games, the games should be loaded fast. PNGoo helps you to decrease the size of sprites often as much as 70% without any quality loss. I use it for my all exported images. If you are making high-resolution sprites and you want sharp images even on big screens, you should definitely use this program. If you want to record your screen or make a live stream of your game development process with a good quality and decent fps rate, Open Broadcast Software is what you need. I use it to record previews of my games (720p 60 fps) and upload them to YouTube. You have probably heard of Audacity if you ever searched any about editing or recording sounds. It’s a really powerful sound editor with lots of options for your audio files. I use it to decrease noises, adjusting sounds, decreasing the size of files, and making background music loops. Lightshot is the most simple and useful tool I’ve ever used for taking and sharing screenshots. You can take a screenshot of each corner of your screen with just selecting the area. It doesn’t only save the images, but also uploads them and copy the link to clipboard. You will save tons of effort and time for sure! On Twitter, everybody loves gif. If you are making a game, you should not just share your game with static images. You can use GifCam to record selected area on screen as a gif. It is a good way to show your game progress and animations. Don’t forget the tags, too! There are some cool indie game bots on Twitter that help your tweet to spread. If you are looking for a tile map editor, this is the best option. Like the other programs on the list, it helps you to create maps much easier. With a few sprites, you can have a good looking level setting. You can also set collision areas or positions for spawning objects. When you finished your level, you can export it as a .tmx file and use it on your engine. XnViewMP like Picassa, but with a gif play option. You can browse your reference images/animations, and convert them. You can also use this tool to rate your images and organize your references. It supports more than 500 formats and I didn’t even know there is that much media format. I’m using this program to arrange all my media files. I use Give Your Fonts Mono for almost every project to create sprite fonts. You simply select a font that on your computer then it creates a PNG and JSON file of it to use on Construct 2. I recommend using sprite fonts other than real fonts because it loads faster and sometimes clients may want the fonts as sprites. Please feel free to leave a comment below and mention any free tools that help you with your projects. If you want to see more posts like this, please share the post and make sure you’ve followed me on twitter. or once you export then you compress all png files in the images folder ? Hey, I’m glad you liked the post! I use PNGoo for exported images. Hey Carlos, thanks for reading! Thanks mate! if you like it, please don’t forget to share! I really appreciate it. A lot of people don’t yet realize that Blender has a powerful video editor built into it. It takes a moment to learn but it ranks up there with the pro video editors. And it can be used to edit videos exported from Open Broadcaster. It’s faster than Audacity, easier to use and looks better. Only thing it’s missing is advanced noise reduction, but we’ll see if that gets built soon. Awesome comment Kawika! Thank you! I didn’t know OcenAudio and Blender’s video editor. OcenAudio looks nice and clean. I will definitely try it. Blender’s video editor is also a really cool tip. It’s hard to find a decent video editor for free without any limitation. Thank you for making the list. Indecision. is now available on Steam!